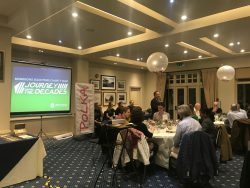 On 14th November we held our annual Wimbledon Charity Quiz and this year the theme was ‘Journey through the decades’ in aid of our chosen charity The Polka Theatre. 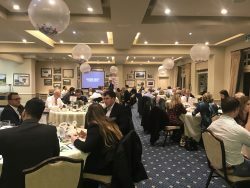 A total of 8 teams joined us at our new venue, The Royal Wimbledon Golf Club to test their knowledge through the ages to find out which decade they really belonged to. 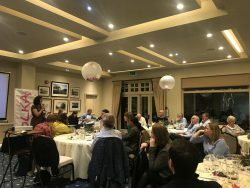 Our guests enjoyed 9 rounds of questions from our quiz master, which featured questions from the fabulous fifties through to the naughty noughties, before finishing with a rather challenging picture round. Our Managing Partner Paul Harvey thanked our guests for coming before introducing Lynette Shanbury, executive director of Polka Theatre to explain more about their fantastic charity and the work they do for the local community. Lynette took a moment to discuss how the money we raise can help a child experience theatre for the first time and with our support they can ensure that these children are not excluded from taking part. Lynette discussed how taking part in theatre can boost literacy, imagination, empathy, confidence and well-being, but more importantly, the opportunity to give young children, from quite challenging backgrounds a fun and memorable experience and the chance to escape briefly from the difficult circumstances they might face at home. Before we announced the winners of the quiz we held our charity raffle which was bigger than ever this year, we would like to thank Bills Restaurants, Smash Wimbledon, Five Guys, Touro Steakhouses, Cote Brasserie, Holistic Fitness, Pho Restaurants and Sticks and Sushi for their generous donations as well as MFS Financial Services and The Polka Theatre for bringing along further prizes to give away. Our winners of the evening were ‘Polka Face’ (The Polka Theatre) and our runners up were Wimbledon Super Marvels (WSM). We would like to say a massive thank you to all of the teams who participated in this year’s quiz and congratulations again to The Polka Theatre for winning by a landslide. 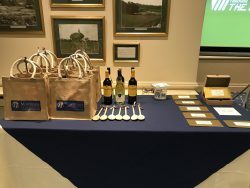 The feedback we received on the night was brilliant and we hope that everyone had an enjoyable evening. With your continued support, this year we managed to raise £1000 for The Polka Theatre.